↑ "CIA - The World Factbook". cia.gov. สืบค้นเมื่อ 2012-09-01. ↑ "West Bank and Gaza". World Bank. ↑ "Palestinian Authority applies for full UN membership". United Nations Radio. 23 Sep 2011. สืบค้นเมื่อ 2011-09-24. : "I would like to inform you that, before delivering this statement, I, in my capacity as President of the State of Palestine and Chairman of the Executive Committee of the Palestine Liberation Organization, submitted to H.E. Ban Ki-moon, Secretary-General of the United Nations, an application for the admission of Palestine on the basis of the 4 June 1967 borders, with Al-Kuds Al-Sharif as its capital, as a full member of the United Nations." ↑ al Madfai, Madiha Rashid (1993). Jordan, the United States and the Middle East Peace Process, 1974–1991. Cambridge Middle East Library. 28. Cambridge: Cambridge University Press. p. 21. ISBN 978-0-521-41523-1. ↑ UN General Assembly (22 November 1974). 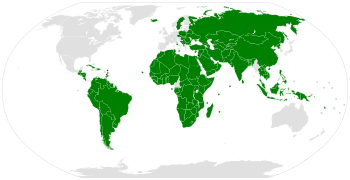 "UN General Assembly Resolution 3237". UN General Assembly (via The Jerusalem Fund). สืบค้นเมื่อ 2011-09-29. ↑ Geldenhuys, Deon (1990). Isolated States: A Comparative Analysis. Cambridge Studies in International Relations. 15. Cambridge: Cambridge University Press. p. 155. ISBN 978-0-521-40268-2. ↑ UN General Assembly (9 December 1988). "United Nations General Assembly Resolution 43/177". UN Information System on the Question of Palestine. สืบค้นเมื่อ 2011-09-29. ↑ Hillier, 1998, p. 205 (via Google Books). ↑ General Assembly Session 55 meeting 54: "Moreover, we are confident that in the near future we will truly be able to join the international community, represented in the Organization as Palestine, the State ..."
↑ "Palestinians win implicit U.N. recognition of sovereign state". Reuters. 29 November 2012. สืบค้นเมื่อ 29 November 2012. ↑ "UN makes Palestine nonmember state". 3 News NZ. November 30, 2012. 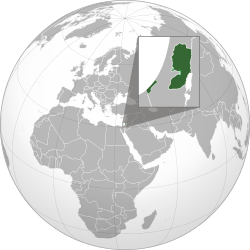 ↑ "General Assembly grants Palestine non-member observer State status at UN". United Nations News Centre. 29 November 2012. สืบค้นเมื่อ 2012-12-03. ↑ Murphy, Kim (10 September 1993). ""Israel and PLO, in Historic Bid for Peace, Agree to Mutual Recognition - Mideast - After Decades of Conflict, Accord Underscores Both Sides' Readiness To Coexist - Arafat Reaffirms the Renunciation of Violence in Strong Terms". Los Angeles Times. Retrieved 2011-9-27. ↑ pp. 44-49 of the written statement submitted by Palestine (PDF format; requires Adobe Reader), 29 January 2004, in the International Court of Justice Advisory Proceedings on the Legal Consequences of the Construction of a Wall in the Occupied Palestinian Territory, referred to the court (PDF format; requires Adobe Reader) by U.N. General Assembly resolution A/RES/ES-10/14 (A/ES-10/L.16) adopted on 8 December 2003 at the 23rd Meeting of the Resumed Tenth Emergency Special Session. ↑ "Hamas leader's Tunisia visit angers Palestinian officials". English.alarabiya.net. 2012-01-07. สืบค้นเมื่อ 2012-09-01. ↑ "A/67/L.28 of 26 November 2012 and A/RES/67/19 of 29 November 2012". Unispal.un.org. สืบค้นเมื่อ 2012-12-02. ↑ Christmas Message from H.E. President Mahmoud Abbas, Christmas 2012: "133 countries that took the courageous step of recognizing the State of Palestine on the 1967 borders." ↑ Sayigh, Yezid (1999). Armed Struggle and the Search for State: The Palestinian National Movement, 1949–1993 (illustrated ed.). Oxford University Press. p. 624. ISBN 0-19-829643-6, 9780198296430 Check |isbn= value: invalid character (help). "The Palestinian National Council also empowered the central council to form a government-in-exile when appropriate, and the executive committee to perform the functions of government until such time as a government-in-exile was established." หน้านี้แก้ไขล่าสุดเมื่อวันที่ 21 มิถุนายน 2561 เวลา 21:41 น.